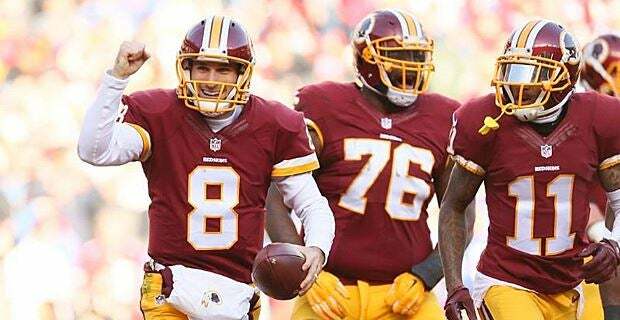 At 6-5-1, the Washington Redskins no longer can control their destiny for a wild card berth, but if they win their next four games, they will be in the playoffs in back to back seasons for the first time since 1991-1992. So far, the rest of the schedule is manageable with the Redskins facing one team with a winning record in their final four games of the season. Listed below is their final four games of the season. While the path to the playoffs isn't daunting, the two major weaknesses for the Redskins could end their playoff chances. RedZone Offense: The Redskins offense outside the 20 yard line is one of the best offensive units in the NFL. The offense can move the football against anyone in the NFL because quarterback Kirk Cousins is a great quarterback and he has plenty of elite weapons to choose from. However, inside the 20 becomes a major problem for the Redskins. The playcalling becomes too complex, head scratching and sometime too much reliance on the passing game. This has lead to the Redskins being ranked near the bottom in the NFL in red zone offense.Offensive Coordinator Sean McVay has done a great job with maximizing his talent, but he along with his players are extremely pressing in the redzone and often times, the Redskins have to settle for field goals instead of touchdowns. McVay could be an upcoming NFL head coach in the near future, but if he wants to go that route, his team must find a way to score touchdowns in the redzone. This issue is a coaching and personnel problem because the Redskins do not have a defense that is good enough to overcome redzone problems. Defense: The Redskins defense is equivalent to a team from the Big 12 conference. The talent level is not very good at all. The unit is very weak in the defensive line and the secondary. Cornerback Josh Norman is their best defensive player on the field, but he alone cannot overcome the major flaws in the defense. The Redskins defense is dead last in the NFL in 3rd down, which means they cannot get off the field and force a stop. That is a major problem for a team competing for a playoff spot. Teams that usually advance to the Super Bowl have a good defense. Fans want Defensive Coordinator Joe Barry fired, but firing him alone will not solve anything relating to the defense. This is a personnel problem and general manager Scot McCloughan must address the needs on defense only in the draft because his free agent signings in the past two offseasons has not entirely worked out. But for right now, the only way the defense can improve is playing the bend but don't break style, which means making big stops on 3rd downs and create turnovers to set up the offense with a short field. The Redskins defense has not committed a turnover since week 11 vs Green Bay. Therefore, the defense must find a way to create more turnovers in their final remaining four games. Despite these glaring issues, the Redskins can still make the playoffs because their offense is extremely potent in the air and on the ground. However, it could possibly be a short stay in the postseason or be eliminated from playoff contention if they cannot improve in the redzone and on 3rd down defense. The next four games will test the character, toughness, and determination of what the Redskins are all about in 2016. At 4-3 and sitting tied for last place is a very competitive NFC East, the Redskins go to London entering their first of many must win games this season. The Redskins nearly left the Motor City with a victory despite committing two turnovers in the red zone and leaving 10 points off the board in the first quarter. However, the defense got beat by Matthew Stafford in the final 1:05 in the 4th quarter. Everyone can say what they want on the defense, but they did not lose the game in Detroit, the offense and special teams did. Also, give credit to quarterback Matthew Stafford because he's having a career year this season with the Lions. Last Sunday was Stafford's 24th game winning drive in his NFL career. When a quarterback finds a way to win that amount of games in the last minute, it is a challenge for any defense. Now, let's focus to the next opponent, the Cincinnati Bengals. They have plenty of talent on both offense and defense, but they are off to a 3-4 start. The Bengals have a great running back tandem in Jeremy Hill and Giovani Bernard. Containing Hill and Bernard will be a major challenge for the Redskins, who have struggled defensively against the run all season. Another major challenge is the health of Trent Williams, Josh Norman, and Jordan Reed. Those three players must be healthy and ready to play if the Redskins have a chance of winning in London. There is still plenty of football left to be played, but the difference between 5-3 and 4-4 going into the bye week is huge because the second half schedule is brutal. At 5-3, it gives the Redskins a chance to play some meaningful games. At 4-4, the chances of making the playoff odds and winning the NFC East takes a hit, and the Redskins will be need to get on a winning streak against the Vikings, Packers, Cowboys, Cardinals, and Eagles. Those teams are in the NFC playoff race. So wake up early, enjoy your breakfast, and hope for a big Redskins win on Sunday morning. Preseason is finally over and the NFL regular season starts this Thursday Night in Denver as the Super Bowl champion Broncos host the Carolina Panthers in rematch of Super Bowl 50. Every year, the NFL produces the best parity in all of professional sports. Who will be the surprise team this season? While everyone anticipates the 2016 season and the higher expectations that added after an unexpected division title last season, another upcoming issue surrounding the Redskins is where their next stadium will be located. 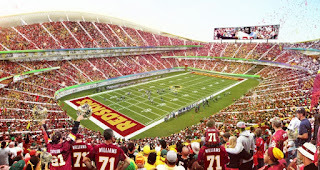 Last Friday , a small bombshell was stated regarding the Redskins new stadium location. Virginia Governor Terry Mcauliffe was interviewed at training camp in Richmond last Friday by former Redskin and current talk radio host Chris Cooley on Redskins owned station ESPN 980 (WTEM-AM) . According to the Washington Post, Mcauliffe wants the Redskins new stadium to be located in the Commonwealth. Another surprising development is that Chris Cooley believes that the Redskins will have a new stadium announced before Election day. The timing of the possible announcement could make sense because the Redskins have their scheduled bye week on November 6th. Economically, having their new stadium in the Commonwealth makes sense for the Redskins. Their training camp site, team headquarters, the players, coaching staff, front office, and most of their current season ticket holders are all currently located in Virginia. Redskins will be able to control their own revenues within their new stadium and Virginia could create a feasible deal that will lessen the cost of the new stadium to taxpayers. Virginia currently does not have a major professional sports team playing at the commonwealth, so it's obvious that Governor Mcauliffe sees a major economic gain from this venture. But for the fans locally, this is a catastrophically bad idea. Virginia is not a centralized location for a new Redskins stadium for all fans in the D.C metro area. As bad as FedEx field is right now, at least it is off the beltway and within reasonable distance and the next metro stop is a mile walk at best. If the Redskins build their new stadium in Northern Virginia, the most likely location will be in Loudoun County between the Sterling and Ashburn area because there is plenty of land available. While the metro's sliver line will extend to Ashburn in 2019, building a new stadium in that area could cause major traffic problems. Anyone who has lived in the Northern Virginia suburbs knows that traffic is very bad on rush hour and occasionally on weekends. Adding an new Redskins stadium will add more congestion along Route 7, Route 28, Waxpool Road, Loudoun County Parkway,and the Dulles Toll Road. Also, the new stadium will not be accessible to the Redskins fans in Maryland and D.C. It is possible that the entire state of Maryland could unofficially become Ravens territory because their stadium will be more accessible to those residents then the new Redskins stadium. That alone, could cause more long problems for the Redskins in terms of growing their fan base. On the bright side, it's a very good sign that the Redskins are trying to break their ongoing lease with FedEx Field, which is currently expiring in 2027. However, they will need to think long and hard on their next new stadium location and figure it what's best for the fans in terms of accessibility. Having the new stadium in Loudoun County will be a major setback. Currently, the RFK stadium site in D.C. provides the best option for the next new Redskins stadium location. RFK Stadium will be torn down in 2018, so the D.C government will need to figure out what to do with the RFK site. However, working with D.C will be difficult because RFK stadium is federally owned land and the government wants the change the Redskins name. But as always in business, once money talks, nonsense leaves. There is still a chance that the D.C. government and the Redskins could agree on a new stadium deal in the District, but the Redskins will need to be very patient, determined, and diligent. But for right now, please stay away from Virginia. Your fanbase will be very thankful for years to come. 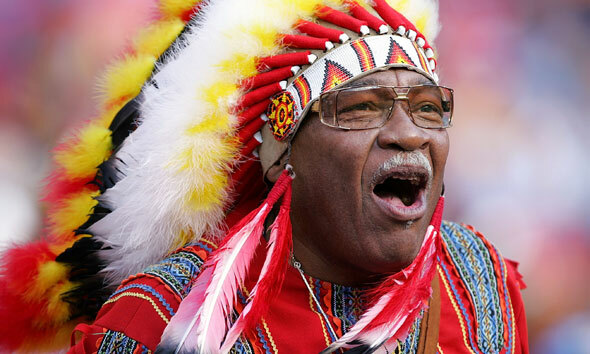 Going to Redskins games this season will sadly not feel nor sound the game anymore because they will be missing one superfan; Chief Zee. Chief Zee, known as Zema Williams, passed away early last week at the age of 75. Except for the four games he missed in 2013 due to funerals, Zema has attended every Redskins game since 1978. Chief Zee was known for his attire and super fandom of the Redskins, especially during the team's glory years from 1982-1991. While fans tailgating at FedEx Field or at the old RFK Stadium, meeting and greeting Chief Zee was the right of passage for millions of Redskins fans. His enthusiasm, attitude, and kind-fullness is going to be missed by his family, friends, and millions of Redskins fans across the world. For folks who want to pay their respects to Chief Zee's, his viewing and funeral will be open to the public. The viewing and funeral is scheduled for Wednesday July 27th at First Baptist Church of Glenarden in Upper Marlboro Maryland. The address is 600 Watkins Park Drive. The viewing will be from 9 a.m. until 11 a.m, followed by the funeral from 11 a.m. to 1 p.m.